"Artificial Intelligence Tools Extension" provides some additional blocks for working with graphs. It is a general-purpose graphs toolset, which includes an implementation of A* pathfinding. NPC in a real-time strategy game needs to research upgrades to produce a desired product. In what order are the upgrades researched? All documentation can be found at my site. 2015-11-24: (Beta Release 1) Initial release. Added 10 blocks. Beta release notes: These are the ten blocks that were required to solve my own problem. I can add more blocks if requested. 2015-11-30: (Beta Release 2) Added graph drawing block. 2015-12-02: (Beta Release 3) Bug fix. Technical Details: There is a bug in the A* implementation that can cause AStar.pathToArray to hang. A* stores information about nodes it has visited in the node itself. Added a function that resets this data each time AStar.findPath is called, so that data from previous searches does not contaminate future searches. 2016-07-20: (Beta Release 4) Added 12 new blocks. 2016-09-29: (Beta Release 5) Fixed bug in blocks.xml. 2016-10-15: (Beta Release 6) Addressed issue with 'cost of path' block in Flash builds. See bottom of page 2 of this thread for details. 2016-11-06: (Beta Release 7) Bug fixes. I'm trying to apply it to an enemy to test pathfinding. How are you generating the graph? 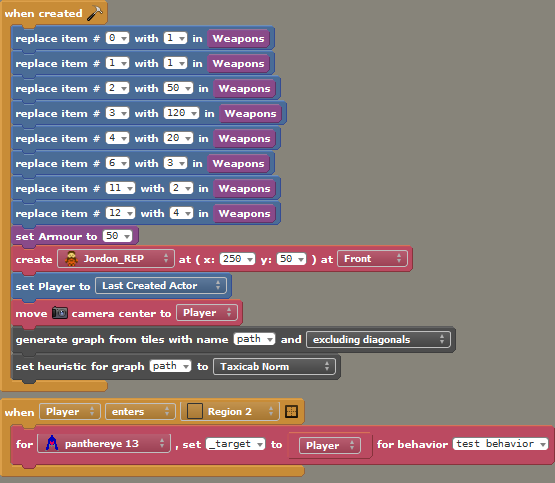 If you're using the "generate graph" block, it looks for tiles with collision shapes defined. It uses the same function as the similar block in the Tile API (using -1 for layer ID). A simple test that it's working right would be to use the block in the Tile API to see if there is a collision shape at one of the walls that is being ignored. If there's no shape, the auto-graph won't work. Can you attach a screenshot of the code you're using to implement the graphs? Getting "The engine extension 'raycastapi' does not exist" error with v3.3.2 and the latest extension and the sample project. The project runs fine, but on loading I get the above error. Any ideas? I just ran into that myself while testing on another computer. I must have left the raycasting API enabled when I exported that demo. You can ignore that error--I don't use any of those blocks. When I'm able to, I'll re-export the project so that warning doesn't show up. I can't seem to reproduce the error. The culprit has to lie within the generate graph block. 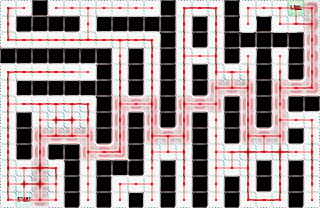 The find path block can only look for a path on tiles that correspond to nodes on the graph. So, for whatever reason, your walls are being included on the graph. The generate graph block uses collision shapes. If the tiles have no collision shapes defined in the tileset editor, then the generate graph block will be "blind" to them. What does debug draw show? If debug draw shows no collision boxes around the tiles, then the auto generation won't work either. One thing I noticed is that you're using item 0 for xlist and item 1 for ylist. The extension uses row and column, not x and y. Try using item 0 for ylist and item 1 for xlist. Also, in your use of the "best path" block, you're using x for row instead of column. Row should be floor of Y of self / 16, not X of self. The graph was rotated by 90 degrees and. It looks like, just by coincidence, the correct corridor (to the left) happened to lead straight to the target if it was rotated. When I get a chance, I might be able to condense all the code required to draw the graph over the screen into a single block. That would catch these types of problems. - Re-exported the demo file with the raycast API removed. This should take care of the error mentioned in the previous posts. Beta Release 3 released--this update fixes a bug that can cause a hang/crash if A* is called multiple times on the same graph. Beta Release 1 and 2 are affected by this bug, so should not be used. Thank you for this. I've read through several explanations, watched a few videos. Tried to adapt some example pseudo code to stencyl for A*, but no matter what I did I just couldn't wrap my brain around it. Then I found your extension. Thanks to you, it's all working now.